This accessory allows you to connect two kilns to a Vent-Sure vent system. It can be added to an existing vent system or can be ordered with a new vent. In some cases you may be able to fire two kilns at once. The Vent-Sure has enough force to vent at least 20 cubic feet of kiln. That means, for instance, that two e28T-3 kilns could be vented while firing at the same time. The "T" duct fitting attaches to the inlet of the fan motor. There are two dampers on it to allow you to both control the flow and to shut off one or the other kiln. Flexible aluminum dryer duct goes between the ends of this "T" duct and the two fittings that attach to the kiln stands. One extra 15' Flexible Aluminum Duct (one is normally included with the Vent-Sure). There are two clamps per Flexible Duct Assembly One Floor/Wall bracket. The photo to the left shows an entire installation to illustrate how the system is put together. 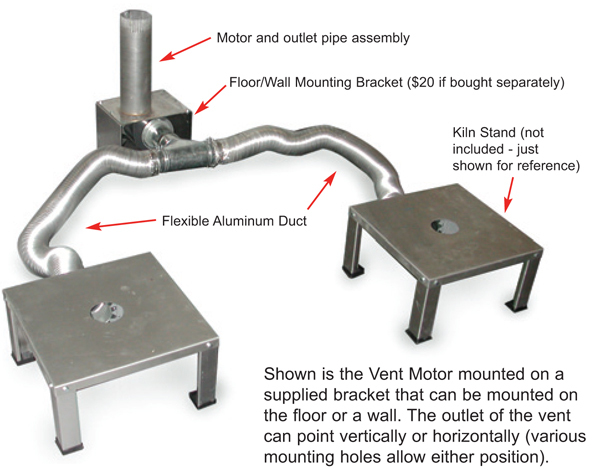 The Vent Doubling System does not include stands or the Multi-Mounting Bracket. It only includes what is mentioned above. (Consider buying a Multi-Mounting Bracket if you need to install the system like the photograph shows).